The Virtual Training Doctor (De Oefendokter in Dutch) is an EIT Digital innovation activity aimed at enhancing elderly people's communication skills and supporting shared decision making with health care practioners. EIT Digital and its European partners today launched a new European care innovation to help elderly people prepare for visits to their doctor. Medical consultations have a small time limit, and elderly people in particular can find it difficult to ask the right questions about their conditions, which can make it difficult to get the best treatment. 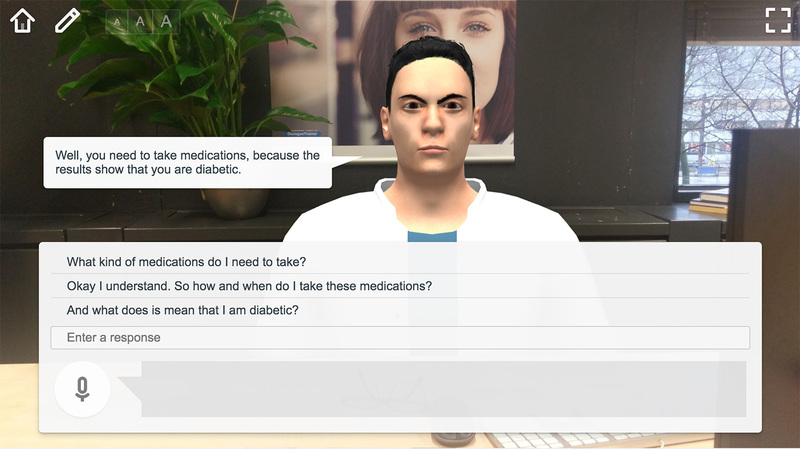 The EIT Digital innovation the Virtual Training Doctor lets you practice conversations beforehand in order to be better prepared for visits to the doctor. The first version of this care innovation will be unveiled today at EIT Digital's BeNeLux Innovation Day in Eindhoven by two of the five partners of the European consortium that developed it. The Virtual Training Doctor (De Oefendokter in Dutch) is an EIT Digital innovation activity aimed at enhancing elderly people's communication skills and supporting shared decision making with health care practioners. In this serious game the user practices with a virtual medical expert. They learn to ask the right questions and make their goals and wishes clear so they can play an active role in their consultation. This improves one to one communication between the health care practioner and patient, enabling them to decide together on the best treatment. Within its Digital Wellbeing action line, EIT Digital invests in innovation activities developed by its partners. The aim is to bring to the market new technological innovations that improve the quality of life of Europeans. EIT Digital innovation activities are always carried out by consortiums of European companies and organisations. EIT Digital has over 180 partners and every year they can submit new ideas for products, services and/or startups in one of its five strategic areas of focus: Digital Wellbeing, Infrastructure, Finance, Industry and Digital Cities. Just before a consultation, elderly patients receive a brief training from Prepdoc, in which they can talk to a virtual character, amongst other things.